The disabled or those with disabled loved ones certainly understand the need for disabled citizens to retain as much mobility and independence as possible. With that goal in mind, finding the right wheelchair transportation service is essential. What to Look for in a Houston Wheelchair Transportation Service? Not all medical transport services in Houston offer the same type of care. Depending on the patient’s unique situation, one may have needs that require a particular type of service. For example, non-emergency medical transport companies often have two separate fleets: one is for the transportation of ambulatory patients, and the other is reserved for significantly disabled or wheelchair-bound individuals. When looking for medical transportation, One needs to be sure the provider serves the area of interest (without any special rates or hidden costs). For instance, those living in Cypress or Jersey Village may have assumed that (due to the proximity) any Houston-based medical transport company will happily serve these areas, as well. That is not always the case, however, especially for same-day transportation for disabled citizens. So, when looking into a medical transportation company get as much information as possible and request a quote before booking your ride. Not all medical transport teams hold the same qualifications. Transportation for disabled citizens in Houston is not the same as a taxi, Uber, or Lyft ride. Medical transport drivers, as well as any other support personnel, should be qualified to handle medical situations that may arise during the trip. A question to ask is whether a medical transport team’s members are First Aid and CPR certified. This is critically important to the safety and comfort of the disabled passenger. Finding the right transportation service truly comes down to asking the right questions and getting thorough answers. Is non-emergency medical transportation the same as a normal ambulance service? By any name, the concept here is that even disabled or senior citizens need to get from point A to point B, and they need to do it safely. Wheelchair transport services like Medbridge Transport exist for precisely that reason. What are the options for transporting a disabled loved one? Getting a disabled loved one where they need to shouldn’t be stressful or complicated. Medbridge Transport is here to take the stress and guesswork out of that process; from start to finish, with a team that strives to deliver a carefree experience every single time. 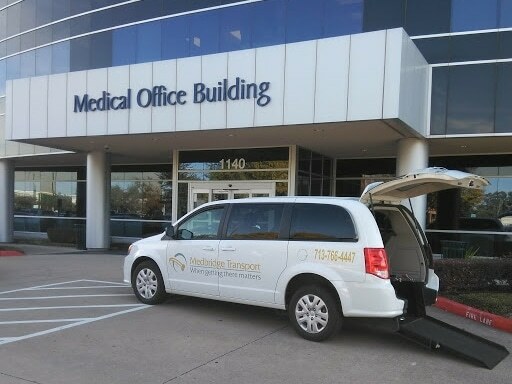 To learn more about wheelchair transportation in Houston or any medical transportation in Cypress or Jersey Village, Texas, call MedBridge Transport today at 713-766-4447. The team is always happy to listen to the needs of the community and suggest the best mode of disabled transportation for one's unique situation.